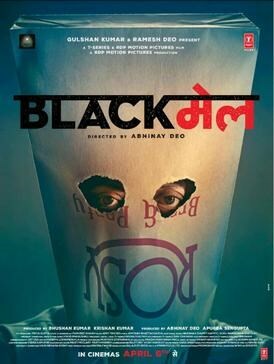 #IrrfanKhan starrer dark comedy #Blackmail takes all the right turns in a routine filled life of bordem. Dev (Irrfan) is seen late doodling in office after hours, before leaving he sends a text to his wife Reena (Kirti Kulhari). Day after day he sends the same message without a difference of a dot, 'Leaving now'. But his life changes the night he decides to take a advice from a friend (who can tell is a girl is virgin just by looking at her) and returns home early only to find his wife fooling around with another man. Dev then thinks of ways to go on with the situation, either kill the wife or the lover, but ends up resorting to leaving the small apartment quietly, runs through streets and gives up within minutes, unlike stereotypical heroes. Instead of catching them red-handed he decides to blackmail Ranjit (Arunoday Singh), Reena's lover. While the movie makes a good start it manages to stay afloat on the idea of realistic characters. Dev who is non-violent being after the harsh truth of his life becomes practical enough to save himself from the cops by twice using his friend as a human shield. The film ends with Dev getting away with the crime he influenced, committed and didn't commit. The film brings forth every actor in a refreshing way and adds to the real tone of the film. The sloppy cinematography increases the film's relatability and music enhances the film's essence. Verdict: Plays out more than a life would but just enough to make you laugh along at the irony.